A week or two ago, I wondered aloud whether the tomatoes in my garden were getting bushy enough. I’m used to Super Sweet 100 plants that are so tall and so bushy that they almost pull over the tomato cages that are supposed to be supporting them. It’s safe to say they aren’t that tall this year, although they are getting taller. What I’m happiest about though is that they have loads of flowers and at least a dozen little tomatoes on them. I’ve been training the branches on the cages as they grow, although I think I need to do a little more staking. Sounds like a good way to spend some of Mother’s Day! 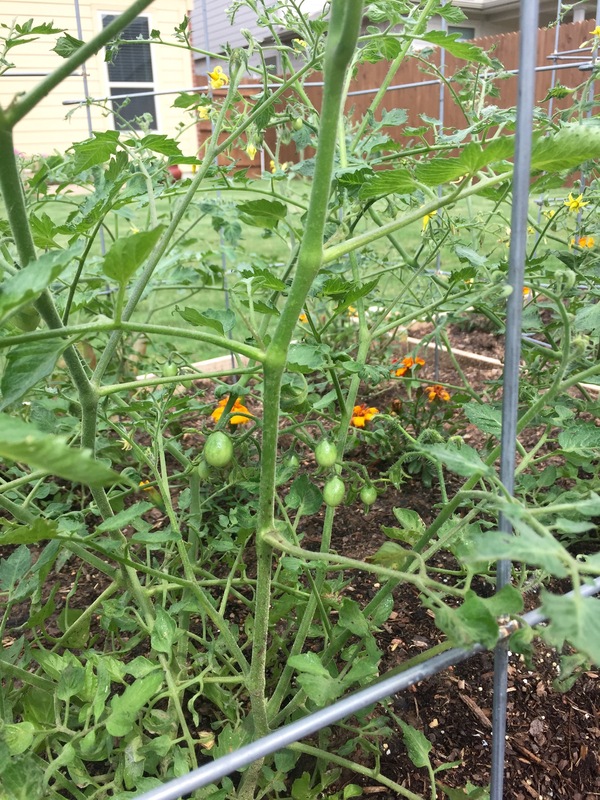 This entry was posted in Gardening and tagged tomatoes on May 9, 2015 by Julie Riebe. Happy Mother’s Day to you, too, Shannon!